Oh Saint Joseph whose protection is so strong, so great, so prompt before the throne of God, I place into you all my interests and desires. 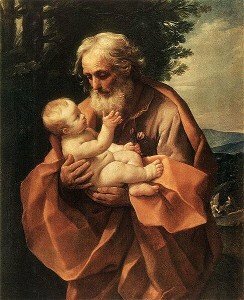 Oh, Saint Joseph, do assist me by your powerful intercession and obtain from your divine son for me all spiritual blessings through Jesus our Lord, so that, having engaged here below your heavenly power, I may offer my thanksgiving and homage to the most loving of fathers. Oh, Saint Joseph, I never weary of contemplating you, and Jesus asleep in your arms. I dare not approach while he reposes near your heart. Press him in my name, and kiss his fine head for me and ask him to return the kiss when I draw my dying breath.Saint Joseph, Patron of Departing Souls pray for me. Whoever shall read the prayer to saint joseph or hear it, or keep it about themselves shall never die a sudden death, or be drowned nor shall poison take effect on them. Neither shall they fall into the hands of the enemy or shall be burned in any fire or shall be overpowered in battle. Say for nine mornings for anything you desire. I has never been known to fail. This prayer was found in the 50th Year of Our Lord and Savior Jesus Christ. finished saying the prayer to Prayer to Saint Joseph, Bring me back to the Prayer List please.